The New Zealand native Manuka tree has an ancient history in the folklore medicine of the Maori. It was used for a wide variety of treatments, such as in a poultice for burns and wounds, for sore backs and inflammations, as a tea drink for digestion and other internal complaints. These treatments parallel the research projects in recent years looking at the properties of UMF® Manuka honey. New Zealand has been at the forefront of international honey research. Dr Peter Molan of the Waikato University Honey Research Institute pioneered this research programme, publishing articles on the antibacterial activities of New Zealand Manuka UMF® honey in many international health publications dating back to the early 1990’s. 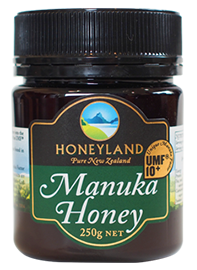 New Zealand Manuka honey producers have registered the trademark UMF® to identify the special antibacterial potency of this honey. UMF stands for Unique Manuka Factor. Not all Manuka honey has UMF® and there is great regional and seasonal variation between Manuka honeys. As the presence of UMF® cannot be detected by taste or appearance, strict protocols for the handling and sampling of Manuka UMF® honey have been established by the UMF Honey Association in New Zealand. Honeyland NZ Ltd, in association with Arataki Honey, is licensed to use the UMF® trademark (UMF License number 1004). The UMF® level is tested by an independent accredited laboratory and rated in comparison to the standard reference antiseptic, phenol. The trademark UMF® is applied to Manuka honey of 10+ or higher, which means that it has the antiseptic potency equivalent to a 10% solution of phenol in water. Every batch of Honeyland Manuka UMF® honey is stringently sampled conforming to protocols and tested to determine its potency. Each jar is then labeled in accordance to test results, guaranteeing the UMF® level as quoted on the jar. This UMF® level is stable when exposed to heat and light, and does not lose its potency in storage.